I still haven’t quite wrapped my head around the fact that I’m done with university for the foreseeable future. It’s strange. In many ways, I still feel just as young and un-adultish as I did when I started my degree four years ago. But my time at university taught me far more than I could have imagined, and not just in terms of my degree subjects. There are things that I know now that would have been super helpful to know when I first started at university. 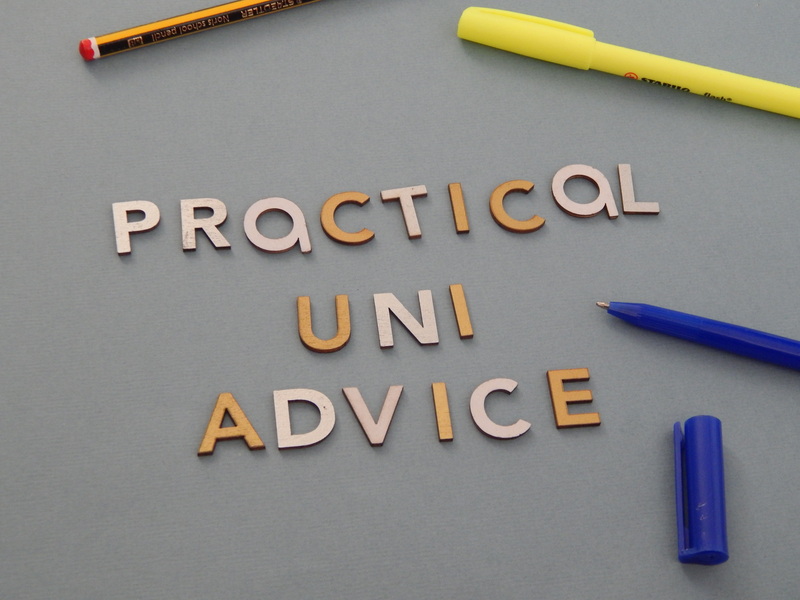 If you are going into first year and can bear to listen to a grizzly old graduate, I thought I would share some of my more practical university advice with you today. I’ve done some posts on the more fun things in previous years but these are the things I learnt from my mistakes and that made my own life easier in the subsequent years of my degree. It is advice that I’ve passed on to various family friends as they’ve headed off to university too. If you are looking for slightly less serious topics (such as what to pack or my tips for surviving freshers week), you can find them here. Although I wrote them a couple of years ago, I hope they can still be helpful for you! Let’s dive right in with the practical stuff, shall we? If you know you are going to be looking for a job at university, you’ll need to be prepared. Try and get in touch with potential employers a few weeks before freshers week to beat the crowds looking for work. You could also see if the careers team at your university have any support for finding part-time work. At St Andrews, I was signed up to the job shop, which was invaluable. This meant that I got an email whenever there were new part-time jobs available. It meant that I didn’t miss jobs, particularly if it was more informal or adhoc work and it took a lot of the stress out of job-hunting. This leads me to the next point – make sure you have all of the necessary documents. I forgot to bring my national insurance number with me when I first arrived at university which made applying for jobs a bit difficult. I ended up having to ring my mum in a panic to find out my details which wasn’t a fun experience for either of us, particularly because I wasn’t entirely sure where it was. It was also nowhere the grown up start to my new life that I had imagined. It’s worth keeping your documents to hand, or at least bringing copies of them with you. If you don’t quite trust yourself to look after them, tell someone that you trust at home where to find them so they can source them for you in a hurry if they need to. ‘Somewhere on my room’ doesn’t quite cut it when everyone is in a rush. Have a supply of any medication and a mini first aid kit with you when you move. Of course, you should register with a doctor as soon as you can but the start of university is a whirlwind. You don’t need loads of supplies but having things like tissues, lemsip, plasters etc will help with freshers flu (or the blisters from wearing your new shoes out) when you really can’t be bothered trekking around a new place to find your nearest pharmacy. It buys you a little time to get your bearings around your new home before you need to restock your medicine cabinet. Let’s talk money. It’s not exactly a comfortable topic but one that’s really important. I also want to preface this point by saying it’s definitely something I’m still learning from and that everyone’s situations are going to be different. The biggest lesson about money that I learnt at university is: do make a budget but prepared for it to change. When I first moved to university, I thought I was pretty good at handling my money. I had already been working for a few tears and had been paying my own way (or at least sometimes). I’d also managed to save a little pocket to make the transition to university a little easier by working A LOT the summer before I went. But I still forgot to take into account the little things like buying washing powder or toilet roll when I began to budget for the year ahead. My budget just wasn’t realistic, especially in regards to all the ‘pop up costs’ of freshers week (think textbooks, society fees, laundry cards etc). It took a good couple of weeks for me to settle on a viable budget and that’s ok. It’s also important to remember that there will probably be plenty of staff willing to help you figure it out. At St Andrews, I spent a lot of time with the financial advisor, asking questions that seemed silly, getting budgeting advice and getting help when my laptop suddenly stopped working in first year and I couldn’t quite afford to fix it. It’s ok to reach out and ask for some advice, whether that’s from family, older students or dedicated staff at your university. With all the celebrations and excitement (or nerves) about moving somewhere new, these are things that can be forgotten. I certainly did but I learnt from my mistakes in later years and I hope you can learn from them soon. Obviously, these are all based off of my own experiences at St Andrews, but they’re the little tidbits I wish I had known when I started. Hopefully, they can help you now!